Big T Woodworks Home | About Us | Opportunities | Sponsorships | Contact Us! Recently I caught up with Brian Timmons from Big T Woodworks. 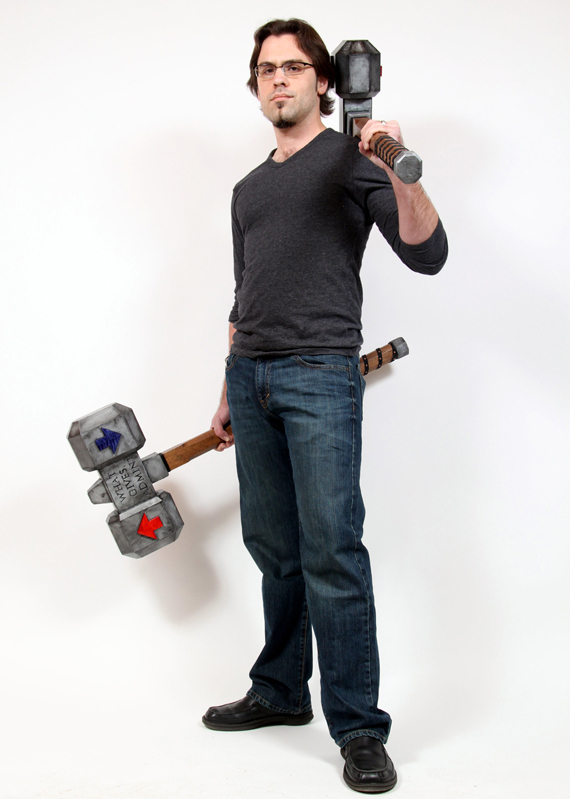 I was intrigued with his background in the woodworking craft, where he has taken on some unusual request such as crafting a Thor-inspired Ban Hammer for the management team at Reddit inc. (www.reddit.com). I am impressed with his Etsy shop where he finely crafts beard combs each with an individual finish. 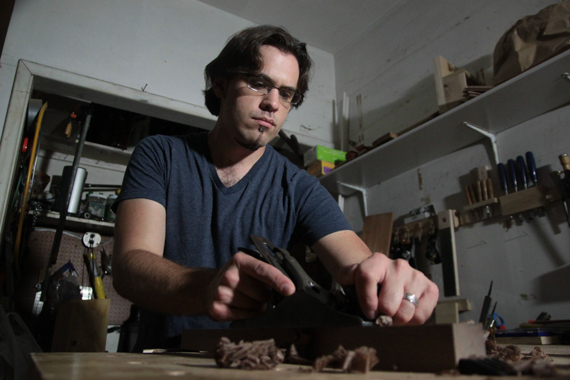 Hearing about Brian’s experiences in the woodworking craft was so interesting that I just had to put his work on Handmademen.com. I hope you all enjoy reading about Brian’s work in the interview. Thanks for the interest. 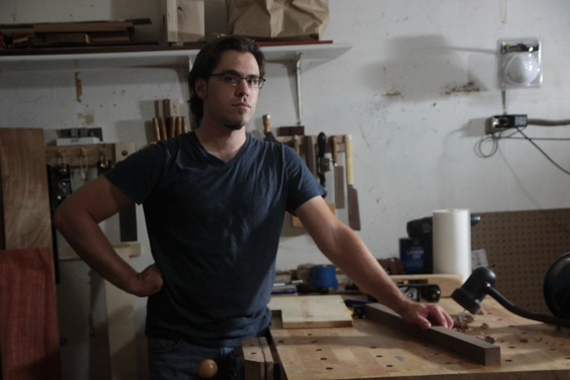 My name is Brian Timmons, and I’m the recent founder of Big T Woodworks. I make stuff out of wood, and my wife runs the business side of things. My journey into the woodworking world has been a strange trip so far. I’ve had a lifelong interest in woodworking, but it wasn’t until I bought a house with a garage that I’ve had anywhere to work out of. My first serious project was a jewelry box I made for my wife. That’s one I’m still proud of, and I want to do more pieces like it. On the more masculine side, I’d like to try some men’s valet boxes with a similar aesthetic. I’ve taken on some unusual requests in the last few years. One such odd request was from the fine folks who run reddit inc (reddit.com). They’d seen the Thor – inspired hammer I made for a friend and decided that they wanted me to create an official “Ban Hammer” for their offices. The orange-red and periwinkle arrows are emblematic of the site, and its users who can decide whether to upvote or downvote content to determine what makes the coveted front page. They wanted two hammers, actually. One for New York City and the other went to San Francisco. I was instructed that they should be “epic and overblown”. I was happy to oblige. As much fun as comically large props are, nowadays I really enjoy making practical things. The wooden combs I make a big part of my philosophy. They’re beautiful to look at and admire because of the choice woods and craftsmanship, but first and foremost they are something that can be used every day. What got you started in creating and designing the various pieces the Big T Woodworks offers? I got started making wooden combs a few months ago because it seemed like it might be fun to do, and it’s something that not many people are doing. I decided to get my business off the ground by selling small items that I can make in limited quantities, and I know that I don’t want to be the ten millionth woodworker out there trying to sell cutting boards. So mainly I did it on a lark and because I didn’t have anything else to do at the time. The first couple were kind of rough around the edges, but people liked them nonetheless. I started to refine my processes and use nicer materials, and then everyone went bonkers and said I should really start to sell them. As my skills improved, I got to the point where I was very proud of the workmanship and material choices, but I still wasn’t sure how well they would sell. But after opening my Etsy store a few weeks ago I promptly sold out in less than 24 hours. You have many quality beard combs in your shop! 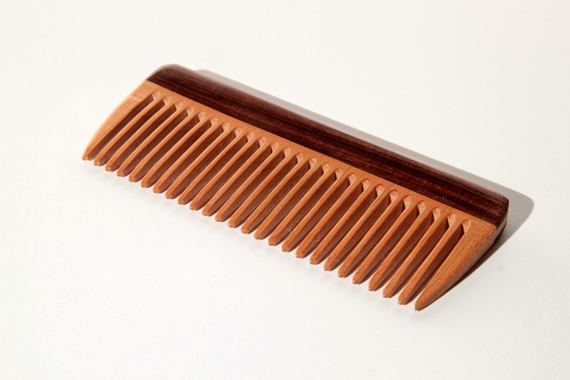 My best seller so far has been my hair comb made from cherry with rosewood grips. 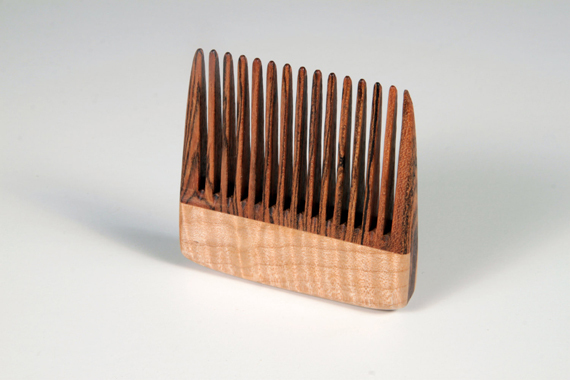 I’m also fond of the beard / hair comb made from bocote with curly maple grips. 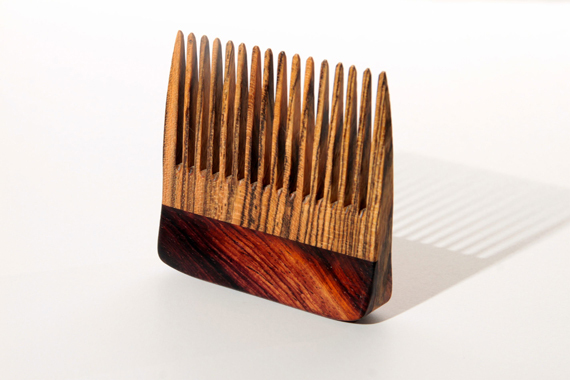 The one I’m most proud of is the beard / hair comb made from bocote with cocobolo grips. The colors and textures on this are just insane. 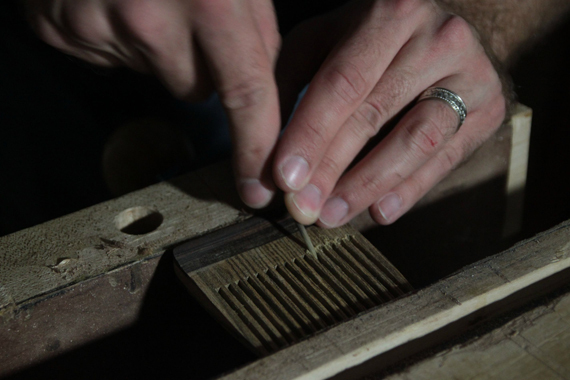 For materials that will make up the actual comb teeth, my main requirements are tight grain, running straight from base to tip for the optimum strength. The wood that forms the grips is running perpendicular to reinforce the thin wide blank that forms the teeth. Without this compound construction, the body of the comb would flex and snap easily. The material for the teeth must be a hard wood with small pores that polish well. Cherry works well for my hair combs in this regard. For the combs with longer teeth like the beard combs, I up the strength ante by using bocote, which is an extremely hard and stiff wood. Despite the hardness, it’s not brittle in my experience. And if you are able to bend a tooth with your thumb, which isn’t easy to do, you’re simply not going to break one of my combs unless you seriously try. I’ve had more than one comb get snagged out of my hands on the buffing wheels, turning my workshop into a wooden comb pinball machine as it bounces off the walls and usually landing on the concrete floor. Despite that high speed abuse, I’ve yet to see one crack or break. The entire comb is shaped freehand on my belt sander and smoothed out with sanding mops in my drill press, with flexible abrasive fingers that move in between the teeth and all around to remove any fuzziness. Then I use a three part buffing system which friction polishes the wood to an extremely high sheen. No film finish is used, so that the beneficial natural oils in hair are allowed to condition the comb, and in turn condition the user’s hair. Why do you think that handmade and OOAK items are a quality option for men? Why should people support handmade? 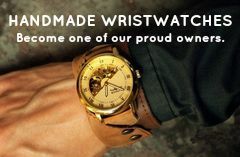 Why should everyone support handmade for the men in their lives? Buying handmade items is seen as somewhat of a luxury, but I’ll argue tooth and nail in favor of the old maxim, “you get what you pay for”. In my case, the combs that I make start at $25.00. That’s a lot to spend on a comb. I realize that. But then think of all the plastic combs you’d otherwise buy over the course of your life that will just end up broken and in a landfill. My combs are built in a way that they’ll likely be used into the next century. So it’s really about spending a little more upfront to pay for efficiency down the line. Then there are the materials used and the workmanship involved. And let’s not forget about the style factor. I’m pretty biased, but I think they’re cool as hell. Buying a handmade gift for someone really is a special thing. It shows a lot of thoughtfulness on the part of the buyer, having gone the extra mile to look beyond the usual store bought fare that you can get just anywhere. It’s a way of supporting the little guy (or gal) who’s decided to remake the world as they see fit, in however small the measure. Buying handmade is more than just a heartfelt gesture, in a way it’s an act of rebellion against the status quo. For me, making things is crucial to my identity. I have a day job that pays the bills, but I get absolutely no fulfilment from sitting at a desk for eight hours a day so someone else can get rich. In the corporate world, I go through the motions now because it’s what I have to do. It’s brain dead and predictable. Making things, on the other hand, is deliberate and spontaneous. It’s how I assert my freedom and how I feed my creative impulse. If I can find a way to do woodworking full time, I will quit my day job at relativistic speed! Tagged ban hammer, Beard Combs, combs, handmade, thor's hammer. Bookmark the permalink. I am currently in the process of making beard oil and came across your amazing combs! How much do you sell them for and what quantity? look forward to hearing back. I have a great deal of unfinished KOA wood for sale, is this of interest to you?